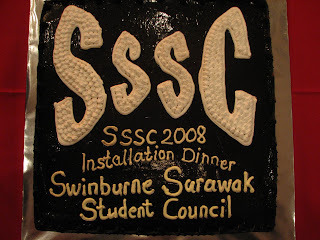 We had it at the Sarawak Club, and seriously, it was actually a very big place for a small personal function with only 4 tables. After the fire last year, it was my first time stepping foot into the newly built club. Much has changed since the fire, although the management has tried all they could to rebuild it to their former glory. There were new pathways, cafes, and the Chinese Hornbill Restaurant where we had our dinner was spectacular. The banner for the night, looks nice ler..
Had a bit of a little crisis before the event though, as Professor Helmut didn't know about the event, because his PA failed to inform him of it. 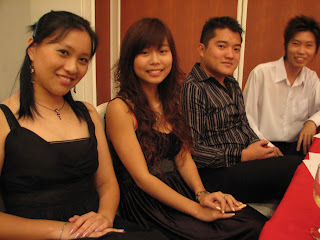 Luckily, Mdm Cindy managed to contact him and he rushed to the dinner ^^ and the great thing about him is, he can go for the dinner totally unprepared, and still be able to deliver a great speech when asked to do so! I really need to develop that skill..
Justin and I were the MC's for the night, and I must say, Justin actually has the whole act together, that it was kinda redundant for me to be there -_-""
The chocolate cake which costs three digits O_O" But it was delicious, so no complaints there ^^ and look! the design was superb too! 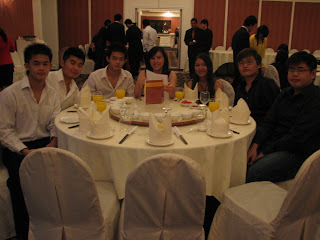 Incoming males of the night, Delwin, Kevin, Wee Chung, Thushanth, Alfred, Justin. 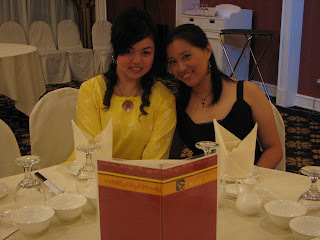 Not in pic would be Chin Ann, and Paul as they were busy doing other stuff.. There's something about a guy wearing a suit and a tie that makes him look so distinguished and polished. It's another matter altogether when there are lots of guys wearing suits and ties. haha..kinda like distinguish overdose..lol.. The night progressed smoothly, with everything in its place. The food was great, the atmosphere was pleasant, and the incoming council all had a great time.